I woke up yesterday morning at 7:57am to a text in the Special Plenary Committee GroupMe of an image with a single word captioning it: “yikes.” The image, shown below, was of chalk writings that someone had scrawled on the pavement outside of the Dining Center, insinuating that a “Cyber Plenary” was not equivalent to a Plenary and calling upon the Haverford community to “boycott.” Though, as I’m sure one might imagine, I was livid–it’s hard to see someone so disrespectfully dismiss the careful thought and attention which you and a group of your peers have put into trying to salvage student voice–I do have to thank the person who made this decision. We had a tremendous uptick in the number of people who signed our call for a digital Plenary, as I’m sure they too were acutely aware of the disrespect such an act entailed. At the very least, people were reminded they had to sign the form, so for that, I’m deeply grateful. For the most part, I’ve kept my opinions about people’s “discourse” to myself, particularly in the Havermemes page and on all forms of social media. I’ve tried my hand at being diplomatic for the sake of maintaining the community’s trust. I wasn’t going to move publicly to address procedural concerns, but given the flexibility and freedom with which these opinions have been expressed, I feel it’s only fair that I have the chance to make my opinions public, too. So before I try to control my anger, I want to ask: where has your outrage been this entire time? Why were you not so moved when students of color came forward saying that they felt continually unsafe and excluded from the classroom, that they were exhausted from constantly having to confront and educate their white peers? Where was your chalk when queer and trans students discussed being misgendered and/or felt they were consistently disenfranchised by their peers and their professors? Why weren’t you out there earlier, knowing that your peers with disabilities found their needs unmet? Where were you at the open discussion for international students (to which all students were invited! ), and where was your chalk when they described how they struggled to explain their experiences to other members of the community? Where the hell have you been? For the love of God, check your privilege. 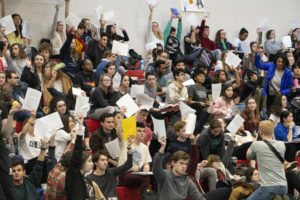 Your desire to whip out your chalk and make a “bold” statement in response to constitutional qualms–and not in response to the indelibly urgent needs of your peers–not only demonstrates how misplaced your efforts are, but also reeks of complacent and uncritical acceptance of the persistent institutional disenfranchisement experienced by students who don’t look, act, or experience the world like you. None of this is to say that you cannot have constitutional concerns; I myself am struggling with what, on the surface, appears to be a deviation from the Students’ Constitution. Nor is it to say that I am some perfect human being who hasn’t hurt my peers before. I am certain that at some (likely many) points during my educational career, I have harmed my fellow students, if only by virtue of my complicity in systems that oppress, subjugate, and render them marginal. You can rest assured that I am deeply sorry for any and all harm I’ve caused. But after being told once, I tried my best to make a change in my behavior so as not to make the same mistakes again. By prioritizing process over a Code that meaningfully includes all students, you fail to acknowledge how your privilege grants you the comfort and safety to express what you believe to be “radical” beliefs to an entire student body. 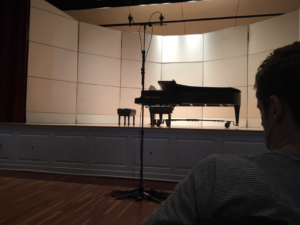 Though I haven’t completely exhausted my distaste for your behavior–I’m not sure I really will–I want to turn now to the decision-making process and to address the concerns that have been raised regarding the digital Plenary process. When we found out that Kim wasn’t in a position to approve the new Academic Code, the Special Plenary Committee, the Students’ Council Co-Presidents, and a group of Honor Council members sat down to render a decision about our next steps. Because of the tenuous nature of Special Plenary, a rejection of any single part of the Honor Code leads to the overall rejection of the Honor Code. What I mean is this: were Kim to reject the Academic Code, all of the work we put into trying to create a Code which fosters inclusion, foregrounds accessibility, and demands real change from the student body would be overridden. And so we had to make a decision in light of an arguably unprecedented situation: were we going to favor strict adherence to a set of constitutional guidelines written by Haverford students in the 1990s, whose relationship to digital engagement was VCRs, CD-Roms, boomboxes, and, as the Constitution itself states, “computer clusters”? 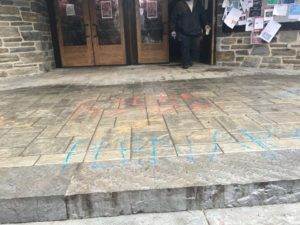 Or were we going to try to the best of our ability to push for a Code that called upon the Haverford community of 2018 to recognize the histories of exclusion and inaccessibility that characterized modern Haverford experiences so as not to allow the serious progress we had made once more be forgotten? 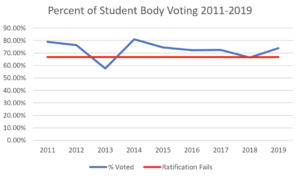 Ultimately, we made the controversial yet, in my mind, nuanced decision to try to retain some attendance to the Students’ Constitution while still salvaging what we could of the Honor Code. We decided to offer a digital Special Plenary, coupled with a series of Town Hall and open forum events that would invite members of the community to occupy physical space should they feel so moved. The digital Plenary will follow the mandates of the Students’ Constitution, while still allowing us to re-envision spaceness amidst time concerns. We anticipate that this will never happen again, particularly because, if this were any other Plenary, we would have just let the Academic Code be rejected, and held off until the Fall to revise it. But for now, this is the situation we find ourselves in. It is, to some, unsettling, unusual, and unappealing. To others, though, whose physical and emotional access is threatened by the over-stimulation implicit within the Plenary space, this may actually be an appealing solution. One thing to note: this is the only way that student voice will remain in the process. We are currently facing a situation in which we have two options: (1) Kim rejects the Academic Code as it currently stands on May 7th, we move into finals without an Honor Code, and he imposes whatever he wants. Though I personally would encourage him to instate the Academic Code we came up with anyway, and I do imagine Students’ and Honor Council would do the same, there is no way of being certain what the administration would choose to do; and (2) we hear the faculty’s concerns about Title IX and academic freedom, we take them seriously, we acknowledge that we need to be foregrounding these concerns and, particularly, the needs of survivors of sexual assault, and we have a hand in making the changes to the Academic Code. If we want student voice to be upheld in these trying times, we need to be willing to be flexible and understand that the rules we have ought not to be desituated from the circumstances that are lived around them. If you’re more philosophically oriented, check out Elizabeth V. Spelman’s book Repair: it’ll tell you all about the thought behind this decision, which is called an “ethic of care.” Hit me up if you want exact page numbers. Another thing: we can actually view this as a constitutional moment that the administration is improvising in order to retain student voice. We’re currently at the time in which President Benston has to make his decision. Because he would likely have to reject the Academic Code we passed at Special Plenary, he’s considering what he would like to put in its place. Rather than just spring something on the student body, though, he’s giving us the chance to actually shape and determine what that thing looks like. This isn’t meant to be a celebration of the administration (though I do think they’re lovely), but just a suggestion that the procedure actually was followed pretty closely. Now, as we waltz into an interim period where the Constitution ceases to have instructions for how the President should act (given its inability to govern administrative behavior), we’re being afforded the chance to actually influence our shared governance rather than just have it imposed on us without our consent. To those wondering why we won’t simply return to the old Academic Code: despite the fact that it would still be up to Kim to make that decision, what a regression it would be! 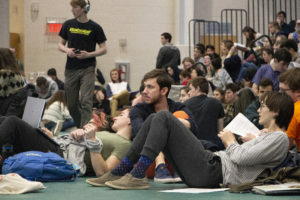 That essentially is the equivalent of saying, “Let’s return to a system with which we took so much issue in the past, let’s hold off on these intense, urgent, and critical conversations, and let’s continue having an Honor Code that exclusively serves the needs of students from privileged backgrounds.” Can we really, in good faith, argue in favor of having an Honor Code that doesn’t take into account the vibrant heterogeneity that ought to flourish within in our classrooms and in our community overall? I think not, and I hope you’ll agree with me. Finally, let me be the first to say: if you want a physical Plenary, you can be my guest and arrange it. I’d attend, and I’m sure the members of SPC, HC, and SC would, too. But, I would invite you to rethink your position until you can figure out where the funds would come from; you can decide on a date (but keep in mind, the only one available is May Day! ); you can arrange for meetings with faculty, staff, and administration, since this is a matter of shared governance; you can table in the Dining Center to get signatures from the student body; you can coordinate with the people in the GIAC, the libraries, the Dining Center, and so on to make sure the physical space is available; you work with IITS to increase accessibility and to improve the WiFi; you can push for gender neutral bathrooms; you can go to the GIAC ~4 hours early to set up each and every chair and table, to make sure that the microphones are working, to ensure that everything operates correctly; you can obtain enough people to reach quorum, particularly given their overwhelming exhaustion; you can wade through a series of friendly and unfriendly amendments in the moment to determine how best to rectify the potential problems underlying your own resolutions; and you can complete every other little detail that goes into planning a Plenary amidst your own papers, exams, theses, and finals. But if you’re not willing to do all of that: please stop faulting us for trying our absolute hardest to make this work. All it does is distract from the real issue of trying to make this community better for all of the people who live in it. P.S. Where’d you get your chalk? I’d love to borrow some to leave messages about the Open Forum on Monday @ 8pm in Stokes Auditorium!